I’ve had a SPOT Satellite Messenger for about 6 months and really like it. 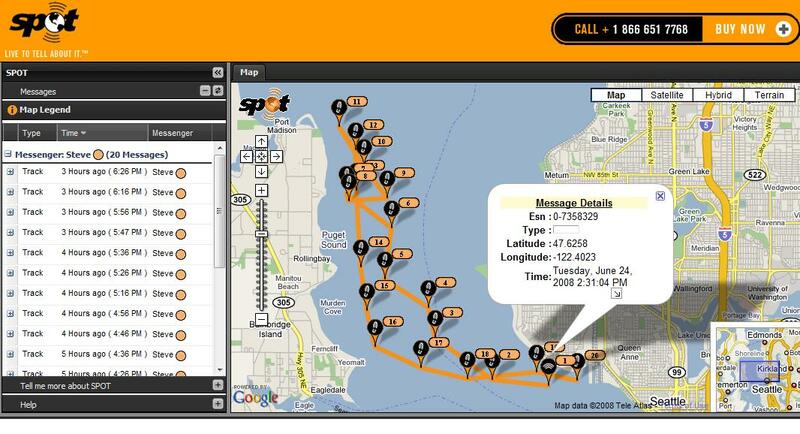 I use it primarily when I sail to keep my friends updated on where I am, and if I’m safe. I have always been a little annoyed that the only ways they could keep track of my course were to save the individual SMS’es or emails that were sent, or I had to give them my password to my private online account at the SPOT home page. Recently, the folks at SPOT came out with the SPOT Shared Page to solve this problem. It’s still a little rough around the edges, but it’s far better than the previous solutions. The page contains a list of the last 24 hours worth of messenger check-ins on the left, and a Google Maps layout of the track on the right. You can click on the track to see more details. Seems to be pretty reliable – does seem to be browser picky right now – Firefox doesn’t seem to work sometimes, and Safari doesn’t work at all. There are some annoying formatting issues as well as images that are missing in some areas. Hopefully they’ll spruce some of this up as more folks find it – it is in beta as far as I understand it.